Confession: this was not my first time reading this book however my first time was well over 10 years ago so I figured it was fair game. This is the kind of book I could read every year and always get a little something useful from. 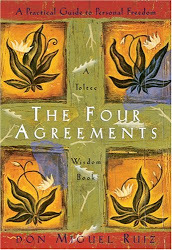 These four agreements, when implemented, can give you tremendous personal power. Your very own power to feel secure, loved, and validated irregardless of those around you or those not around you. So simple, in fact, I don't have much more to say about them except that they have removed a veil and with it came a lot of pressure. Phew.